When you've added multiple companies within your HoneyBook account, you can choose to invite team members to more than one, or create entirely separate teams for each! Team members will need to be added individually to any company to which you’d like them to have access. Adding a team member to a company is very similar to adding a team member to your main HoneyBook account, except you’ll begin in the Settings page for the specific company you’re adding to. 2. If you’re not already in the account for the brand you’ll be adding a team member be, select the icon for the appropriate company. If you have more than 2 companies, click the Plus (+) icon to see your full list of companies and select from there. 3. 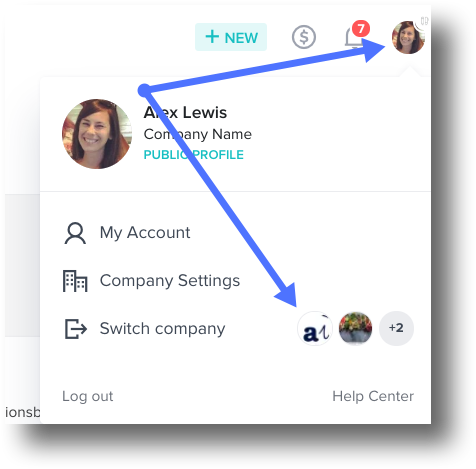 Once you’re in the account for the correct company, click your profile photo again and select Company Settings from drop-down menu. 4. Click the Team tab. 5. Click Invite, enter the team member’s contact information, and select their role. If a team member has been added to multiple companies, they'll be able to toggle between whichever companies they’re a part of!